Now, answer me honestly: if you were asked to identify the country the city shown below can be found in, would Slovenia even cross your mind? I can tell you, in all honesty, that I definitely didn’t think of Slovenia when I was first asked to guess. I took one look at the hilly terrain, those orange roofs, and that turquoise sea, and I thought that, well, it’s probably in Croatia. When I was told that I was looking at Piran, Slovenia, I couldn’t resist undertaking my own quick Google search. I had to make sure that this person wasn’t pulling my leg. And this time, they really weren’t. It’s almost a well-known fact that Slovenia is becoming an increasingly popular travel destination. During peak travel season, cities and towns, such as Ljubljana and Bled, are filled with international travellers. This growing Slovenia craze totally makes sense though. From gorgeous snow-capped mountains, unlimited outdoor adventures, magnificent architecture, and a mouth-watering cuisine, Slovenia has a lot to offer. Yet, compared to other parts of the country, Slovenia’s 47 km coast, also known as the Slovene Riviera, doesn’t always make the cut on travellers’ itineraries. Today, I’m going to try to change some of that by sharing the medieval city of Piran with you. Read on to discover 8 reasons why you need to need to visit the westernmost city in Slovenene Istria, and get ready to discover the best things to do in Piran! As usual, all suggested sites and activities are budget-friendly. Please note that this post contains affiliate links. If you purchase/book any of the linked products or services, I will earn a small commission. There’s no extra-cost for you. Any earnings will simply be used to keep snowtoseas.com going. Thank you for your support! Snow to Seas is the name of the blog, so let’s start with the sea! The city of Piran sits on a peninsula, which is surrounded by the gorgeous Adriatic Sea. While the Istrian coast is known for being rocky, you can find numerous stairways around the peninsula descending right into the sea. So if you fancy a refreshing dip on a hot summer’s day, you can easily head right in. 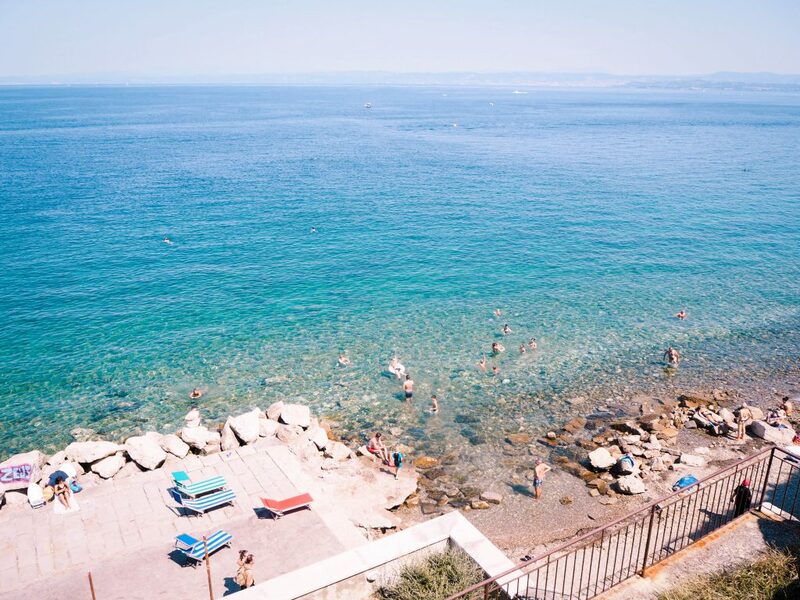 What’s also worth noting is the proximity of the sea and swimming areas to Piran’s old town. The sea surrounds most of downtown Piran, so you’ll never really be more than a 10-minute walk away from its cool, salty waters. 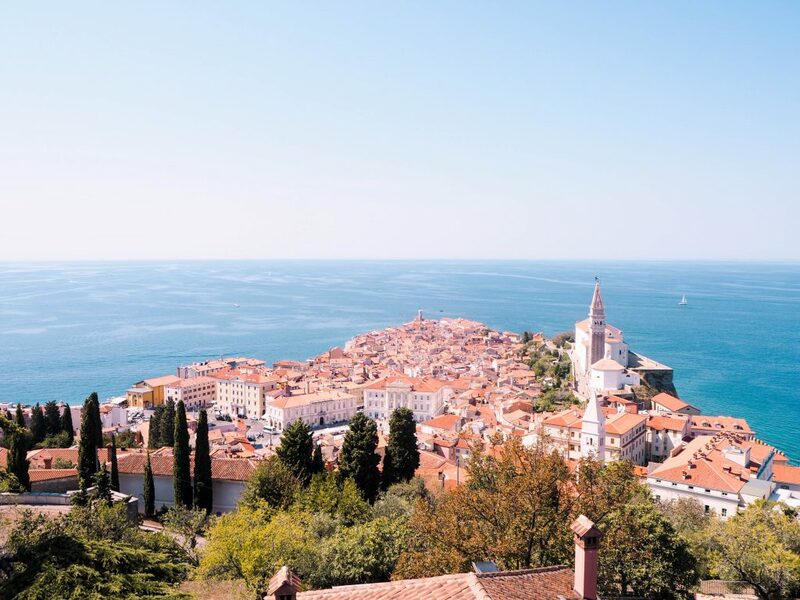 Even though Piran is a rather small city, you won’t find one – but TWO – spectacular spots for catching the best bird’s-eye views of the Slovenian Coast. To experience your first panoramic view, head up to St. George’s Parish church, which was built on a hill just above the old city centre. For €1.00, you can climb up the church’s campanile (bell tower). Looking out over Tartini Square, Piran’s main city square, from the bell tower. Like Dubrovnik, Croatia, Piran also has its own set of “city” walls. 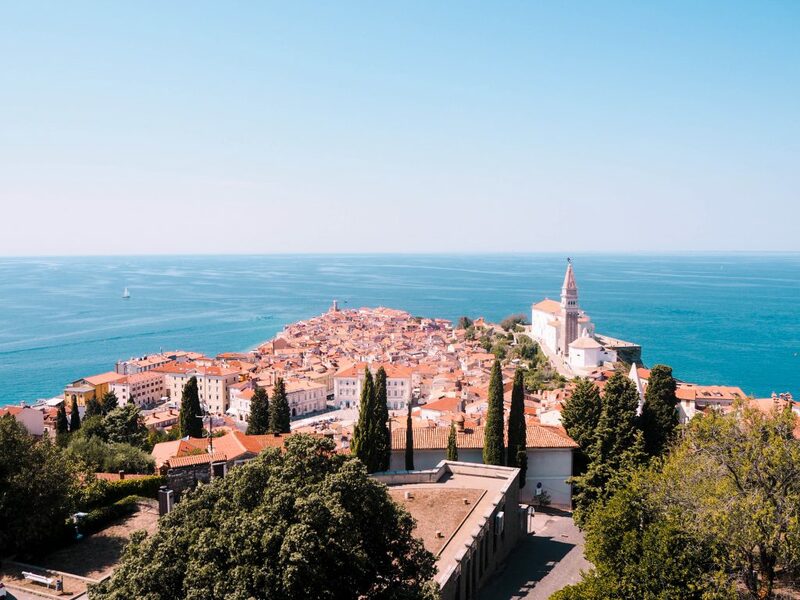 They are not as lengthy and elaborate as Dubrovnik’s city walls, but you can still get one spectacular view of Piran and the sea from the top. The mind-blowing view from the city walls. Now, maybe you’ve looked at a few of the pictures in this post and you’ve done a double take. Maybe you’re convinced that you’ve seen some of these buildings before…but not in Slovenia? Well, you’re not wrong. Did you know that St. George’s Church bell tower is a copy of St. Mark’s Campanile in Venice? The Town Hall is the impressive white building on the left. The Venetian House is the peach coloured building behind the outdoor café. Just look at those windows! I guarantee that if you search the Venetian House on Google, only images of a bright red building will come up. Until recently, the house was red. It was repainted peach because it was revealed that the pale shade was actually the building’s original colour. I already mentioned the Venetian influences on Piran’s architecture. Nevertheless, there are two more things about the city that I absolutely adore: the narrow, winding side streets and technicolour homes. It’s all about primary colours on this street. 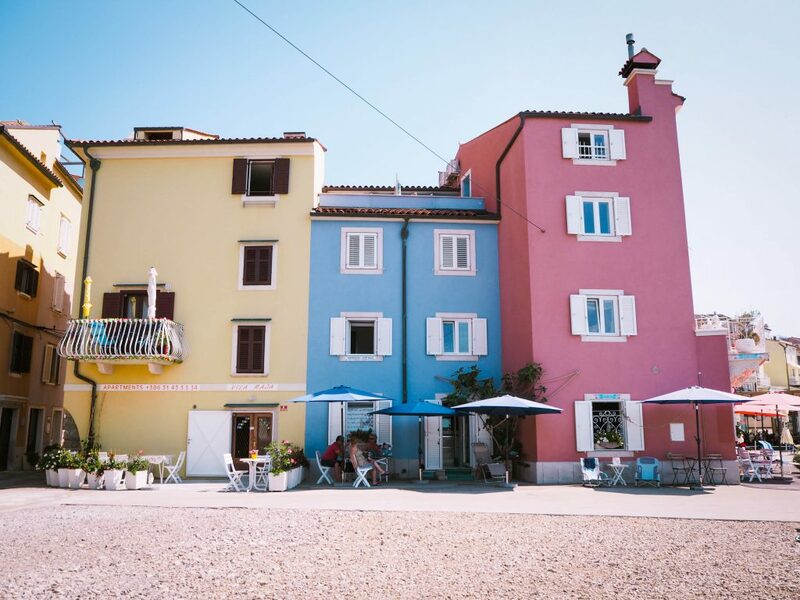 When visiting Piran, take 30 seconds to write down any colour and shade you can think of. 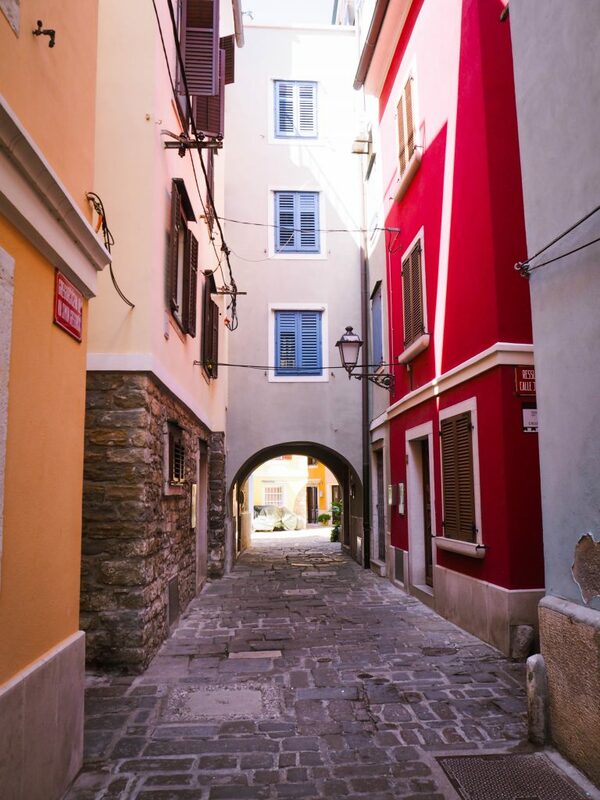 Then, embark on a scavenger hunt and get lost in the old town’s side streets. See if you can find a building that matches every colour and shade you wrote down. You probably will! And rest assured – even if you start feeling like you’re lost in the maze of inner city streets, you won’t be for long. 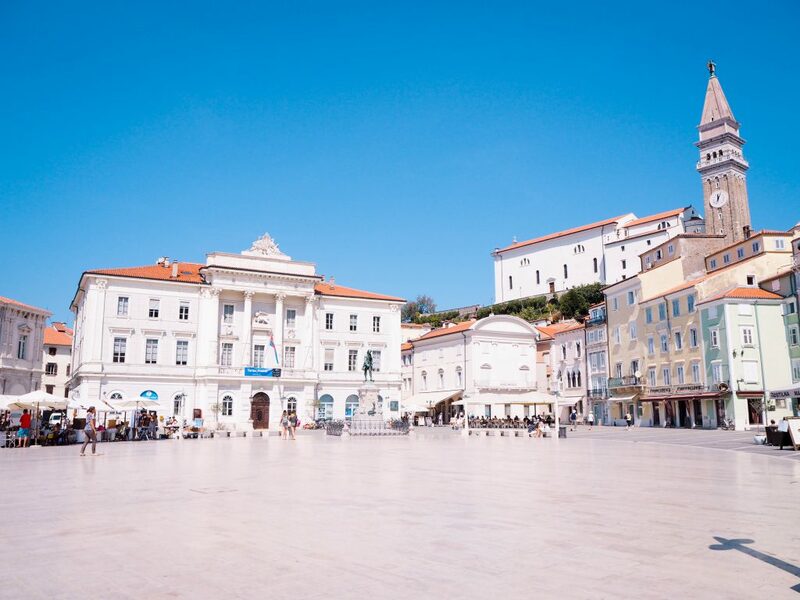 Piran’s old town is surrounded by the sea and Tartini Square. Just keep walking in one direction, and you’ll quickly end up somewhere along the waterfront promenade or the square. I wouldn’t mind navigating through these city streets every day. Sunsets are pretty spectacular regardless of where you are. However, I’m not the only one who will claim that there’s something extra-special about watching sunsets from the Slovenian coast. Day to day, no two sunsets will ever be the same. The pastel hues that fill up the evening sky will definitely amaze you. Also, it’s pretty magnificent to watch the sun grow into a flaming, fiery sphere before it magically descends into the depths of the Adriatic Sea. 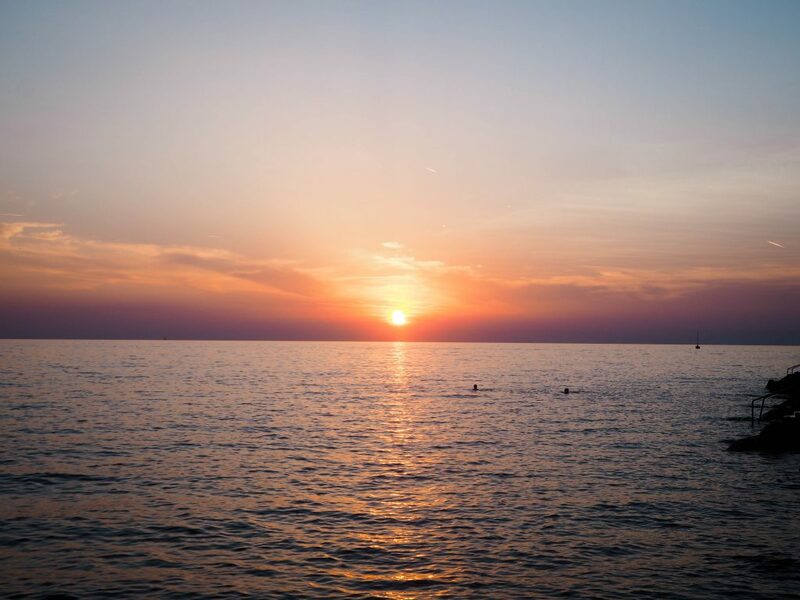 Tip: For the best sunset views in Piran, head over to one of the piers in Piran’s Harbour or watch the sunset from the southwest side of the city’s waterfront promenade. This snap was taken from the promenade. Located right by the Adriatic Sea, you’ll endless opportunities to feast on fresh and delicious seafood in Piran. I certainly did! Countless restaurants line the city’s waterfront promenade, so simply pick one with a menu that caters to your interests and foodie needs. 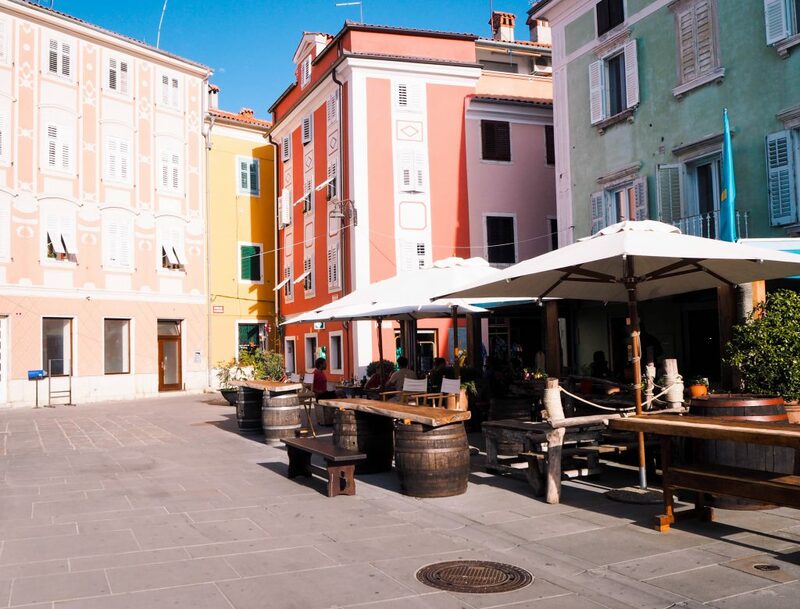 If you’d rather have a view of Piran’s vibrant side streets while you dine, you can also find an abundance of restaurants inside the old town. 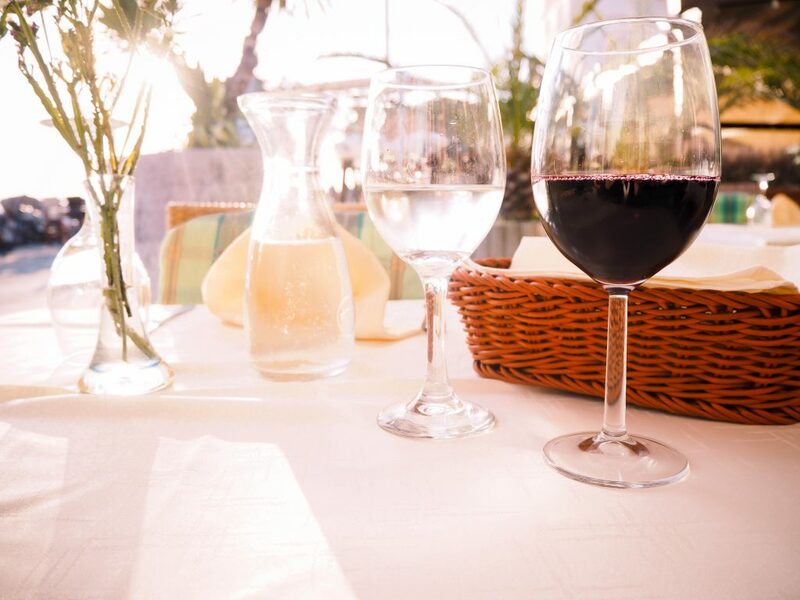 Tip: if you plan on combining dinnertime with sunset time, you may want to consider making a reservation at your restaurant of choice ahead of time. Restaurants often get busy around sunset. Fresh calamari from Restaurant Pavel 2 in downtown Piran. In addition to mouth-watering seafood, Slovenia’s Primorska wine region is also found along the coast. You can always go on a wine tasting tour, but if you don’t end up having the chance to, order a glass (or bottle) of local Refošk wine to accompany your meal. Alternatively, you can pick up a bottle from any supermarket too! A delicious glass of red refošk wine. There are three major towns in Slovenian Istria: Piran, Izola, and Koper. All three towns are well connected by affordable public transportation. If you fancy exploring more of the Slovenian coast, you can easily do so! A bus ride to Izola takes around 25 minutes and the drive to Koper takes just under 50 minutes. Alternatively, many companies offer bike tours along the coast too! Before arriving in Piran, I actually spent a night in Izola. 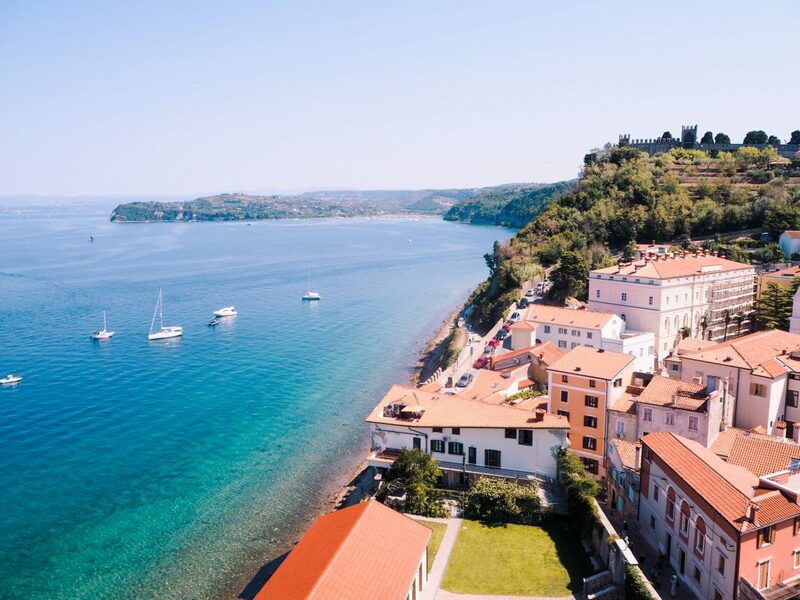 Even though Izola is quite a bit smaller than Piran, it still has a fantastic waterfront promenade, swimming areas, and a picturesque old town. While Piran wasn’t really packed with visitors during my stay, it was definitely busier than Izola. 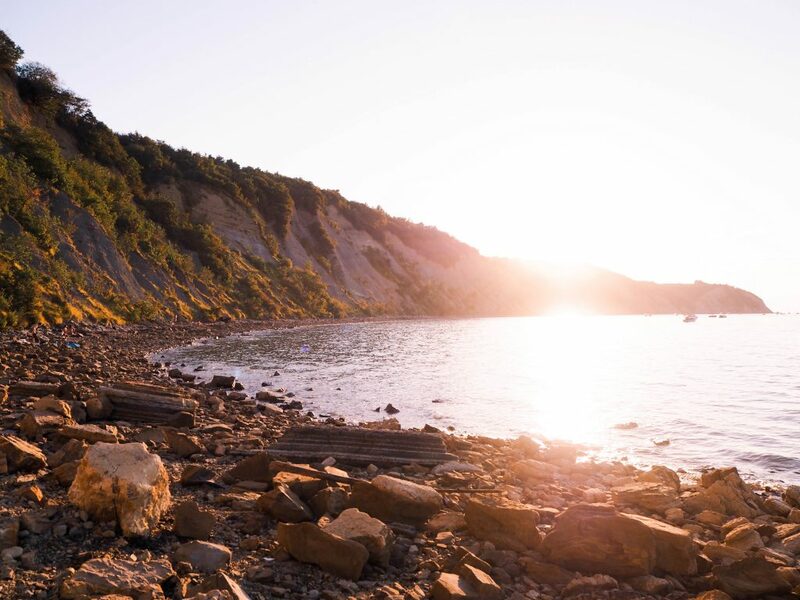 If you’re on the hunt for a town that’s a little quieter, go and explore beautiful Izola. Izola’s waterfront and swimming area. Manziolijev Trg (Square) in downtown Izola. Sunset at Bele Skale Beach close to Izola. All in all, I should also add that if you’re not a fan of rocky beaches, you can always take a small shuttle bus from Piran to the seaside resort strip of Portorož. The bus ride costs €1.00 and takes less than 10 minutes. There, you’ll find your coveted sandy beach. 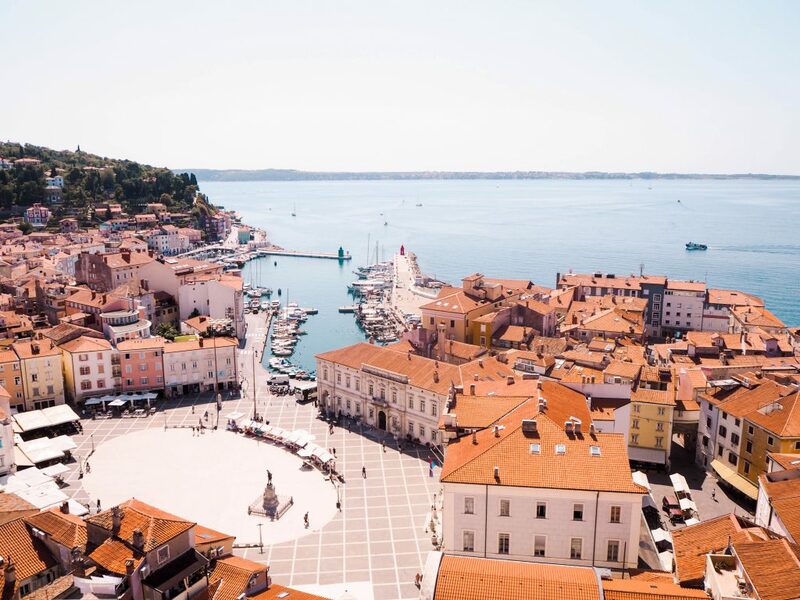 Out of the three major towns along the Slovenian Coast, Piran is the only one that serves as a port for Liberty Lines ferries during the summer months. With Liberty Lines, you can easily get to Pula and Rovinj in Croatia or Trieste, Italy. Instead of taking the bus down to Pula after exploring the Slovenian Coast, I chose to take the ferry, which was a fantastic way to experience and admire the stunning Istrian Coast. Depending on the day or season, ferry tickets can be pricy (or entirely unavailable). Fortunately, you can easily find your way in and out of Piran by bus. During the summer months, the Croatian bus company, Autotrans, operates buses from Piran to Croatian cities in Istria, such as Rovinj and Pula. Off-season, Flixbus has buses running from Portorož to Istria. Similarly, you can also take Flixbus from Portorož to Trieste, Venice, Milan, and more. If you’re coming from or heading to Ljubljana, you can check bus times on Ljubljana’s Bus Station website by clicking here. There are several buses running every day. As suggested earlier in the post, Piran is an affordable place to visit even if you’re on a budget. Countless activities in the city are absolutely free, and most of the entrance fees you may come across can’t be beat. I honestly can’t remember the last time I was charged only €2.00 to climb some historic city walls (…thinking back to the €20 I paid to access Dubrovnik’s…). Hostel Adriatic Piran is located on a calm side street in downtown Piran. It will take you less than 5 minutes to walk from the hostel to Tartini Square or to a swimming area along the waterfront promenade. The hostel’s cleanliness was also extremely impressive. Please note that Hostel Adriatic Piran doesn’t offer breakfast in the mornings. However, it has a pretty great shared kitchen, and there are many supermarkets nearby. Click here to check the hostel out. If you’re hoping to explore in a smaller coastal town, I highly recommend visiting Izola. If you plan on spending the night in town, consider staying at Hostel Alieti. (I actually ran into people who chose to stay in Izola because of Hostel Alieti). The hostel is located in downtown Izola and is less than a 5-minute walk away from the town’s waterfront promenade and swimming area. The hostel is super clean, offers breakfast (for a small additional charge), and has a shared common area and kitchen. Of course, I can’t forget to mention that at Hostel Alieti, you can turn on the A/C during those hot summer nights. Click here to check the hostel out. A snap from Izola’s harbour featuring downtown Izola in the background. What’s not to love about the Slovenian Coast? The area is a seriously underrated little gem – no, GINORMOUS GLITTERING SAPPHIRE – with activities and attractions for all. 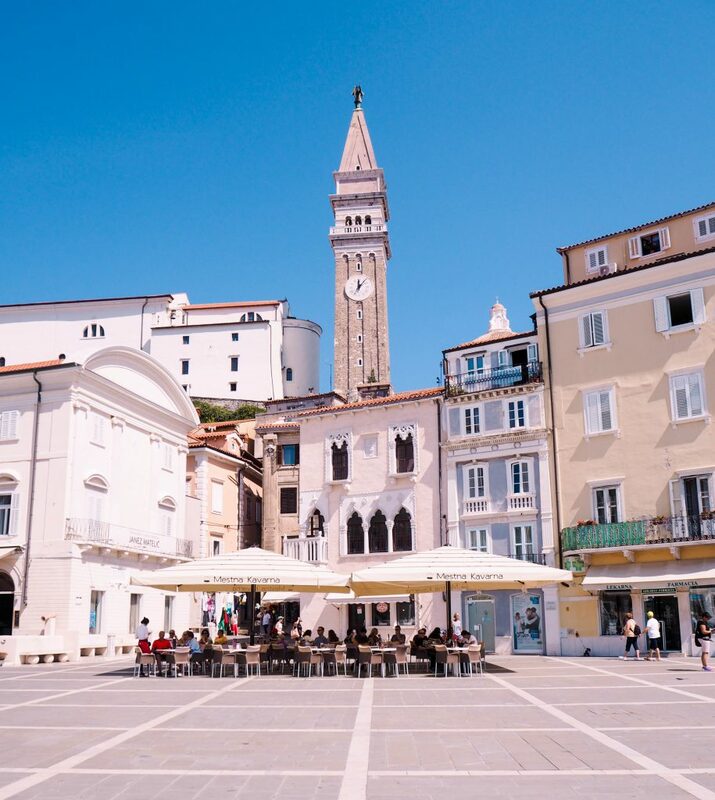 With its idyllic location and absence of crazy, dense crowds (just scroll up and take another look at those photos of Tartini Square in mid-August), Piran is the perfect place to take it easy and enjoy those sunny summer days. Have you been to Piran? Would you like to visit the Slovenian Coast? Share your thoughts and experiences in the comments section below! I would’ve thought Croatia too just by that first photo! Now I gotta add Piran to my list & go visit. 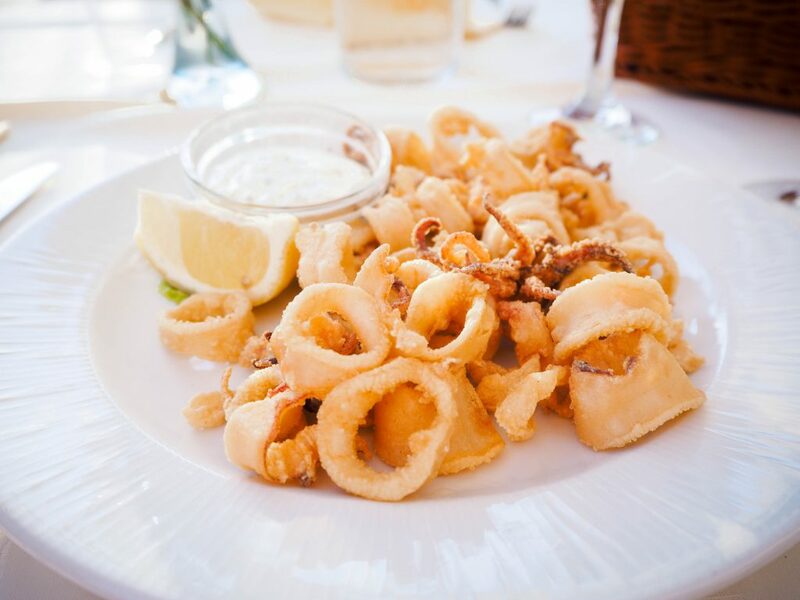 Especially for some of that calamari – yum!! Oh wow, what a stunning place. Never realised that Slovenia had coastal destinations like this one. It reminds me a little of Kotor, Montenegro. What a beautiful area and your photos are amazing. Definitely a place I need to visit. Wow I’ve got to admit Slovenia definitely wasn’t the first, second or even third destination that would have come to mind looking at the first photo! You’ve now got me putting Slovenia on my bucket list!